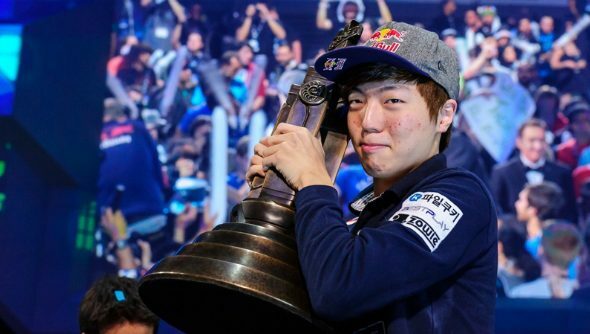 Eight arrests have been made following the investigation into a StarCraft II matchmaking ring after reports that World Champion Lee “Life” Seung-Hyun was involved. Want to be World Champ without getting arrested? You’re going to have to git gud with the best strategy games on PC then. The arrests, made by the Changwon Regional Prosecution Service in South Korea, also include fellow pro player Jung “Bbyong” Woo-Yong and six financial brokers who instigated the matchfixing. Life, who won the WCS 2014 Global Finals, is charged with receiving 70m Won ($62,000) in order to manipulate the results of two matches in May of 2015. Both matches were played in the KeSPA (Korean e-Sports Association) Cup, where the majority of the brokers are charged with organising fixed results. Bbyong is charged with throwing a match in January of this year in a GSL Season 1 match. It was in January that investigations into an extended ring of match-fixers were made aware to the public, after 12 individuals were identified and nine arrested in October last year. The October arrests indicted PRIME coach Gerrard and pro player YoDa, earning them life bans from StarCraft by KeSPA. The broker implicated in those arrests, Enough, is a former StarCraft Brood War pro player, who transitioned into working as a journalist on the eSports scene. Enough is charged during this investigation round with being the supplier of Life’s money for throwing both matches, as well as betting on the outcome of those matches and winning an undisclosed sum. There are a further two individuals who have been indicted but not arrested, with one other individual remaining at large. “This second investigation confirms esports match-fixing is occurring on a broad large scale, highlighting the need for not only continued policing, but extreme measures from the Korea eSports Association,” the Changwon Prosecutor’s report recommends, translated byTeamLiquid.